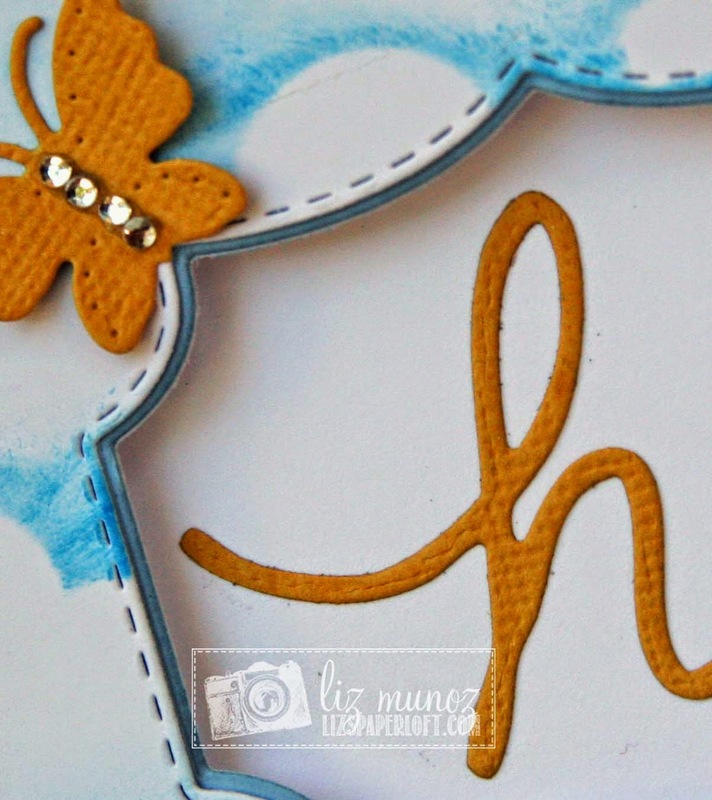 Liz's Paper Loft: MCT September Sneak Peeks Day 1 ~ Hi! 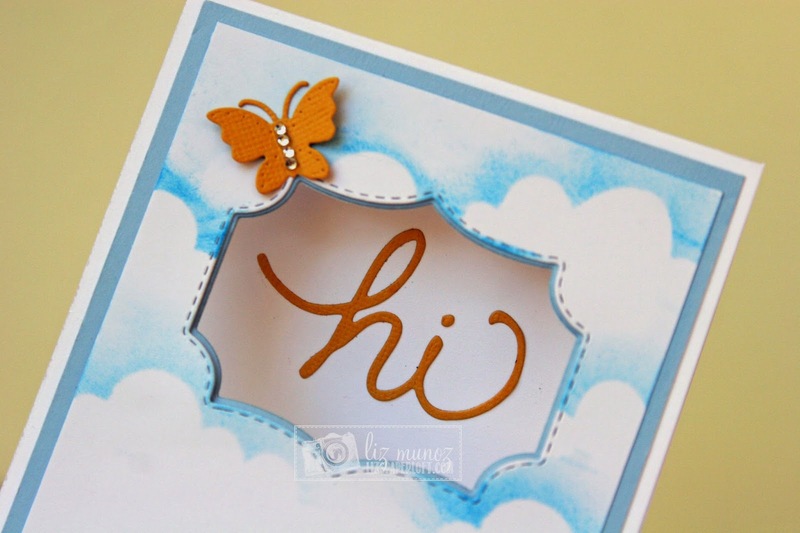 MCT September Sneak Peeks Day 1 ~ Hi! There are so many pieces to this new die set, I couldn't possible use all them! I love the way the "window" dies nest to get that layered look. The window is amazing!! The stitching adds such detail & really draws your eye to the card!! 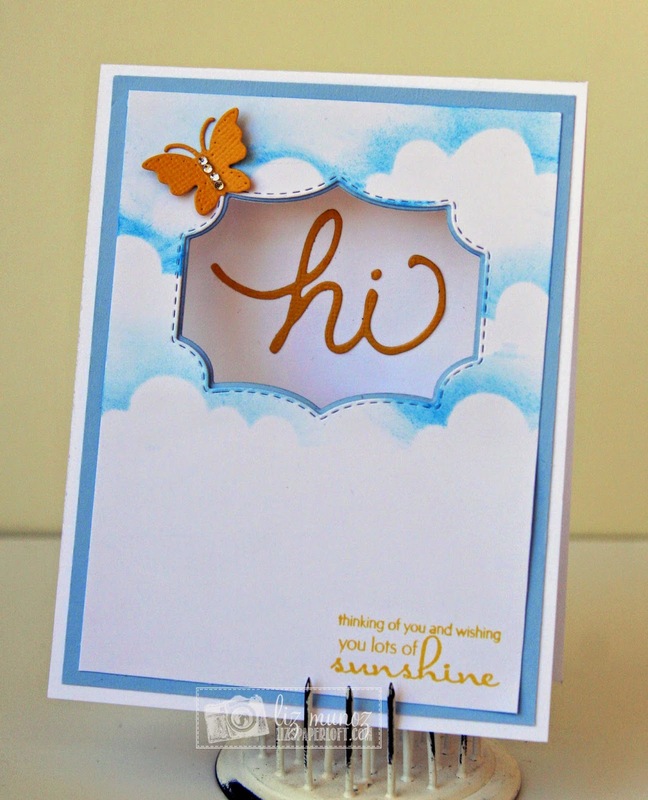 The clouds are simple, its a simple card yet there's so many layers & design techniques! Great job!! OMG Miss Liz and HI right back atcha!! Your card is totally out of bounds!! You totally rocked today's Sneaky Peek! girl you are so stinkin' talented. I just love how you've used all of Miss Emma's goodies. Lucky person who gets your card....Very Lucky person!! I'm jealous!! YOU so ROCK!! What a gorgeous card Liz! OMG I just love the window and those gorgeous clouds are AMAZING!! Love the way you used the newer label die as a window. I LOVE your WONDERFUL card. 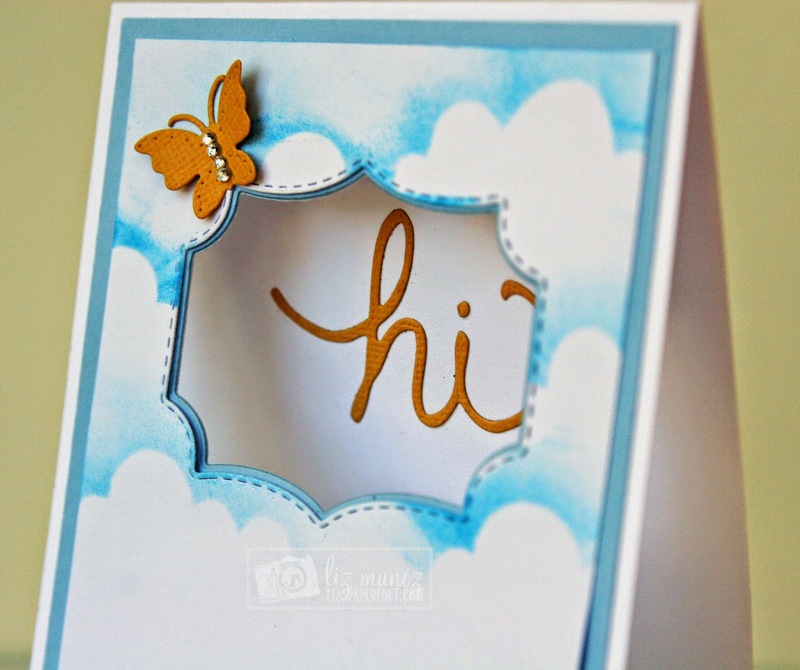 Love your die cut window and the sweet little butterfly. Thanks for sharing. Beautiful, love how you highlighted the window with the sponged clouds!!! This is so pretty!! I love the clouds and how you did the window!! Fabulous! Hugs!! That new label die looks perfect as a window card to highlight the word die. Beautiful, the way you did the clouds. What a beautiful card Liz!! I love how you made a window and all of the details you created with the clouds and accents!! SO pretty! Love the negative cut Liz. Looks great! Fab showing of day one!!! Great job on the clouds. Love the cutout. A fun idea. Terrific card! I love how you used the die to cut the window and love those clouds! Very cute with the clouds and the window. Never would have thought of using the dies to layer the window. Very clever! What a great card-the clouds and cut out are so clever! I love how you made a window on your beautiful card. Great job, so pretty. Liz ~ BEAUTIFUL card! I LOVE how you used the frame die for a window then the word peeking through! Oh your clouds are simply BEAUTIFUL too! AWESOME CAS card!!! Great card I love how the stitching focuses your eye on the Hi. Tfs. Perfect dies (I sooooo need these) + a gorgeous card = one very happy me! Thank you for sharing! WOW!! This is absolutely AMAZING!! I love this card and the way the cloud background turned out. Your window card is unique in the way you used the two dies to layer the window! Love it! WOW Your window is amazing! So diggin' Emma's new dies! Your clouds are beautiful and the window is awesome. Wonderful job! This set is a must have for sure. Lovely card Liz! the new dies are fantastic TFS! Love how you did those clouds Liz! Sooo cool! MCT September Release Sneak Peek Day 4 ~ Coffee! MCT September Sneak Peek Day 2 ~ Spooky! MCT Thrifty Thursday ~ Big Girl! MCT Scrapping The Little Things ~ You & Me! PKS Photo/Color/Sketche Challenge ~ Boo! PKS Change Up Your Stamps ~ Need a hug? MCT Made In Minutes ~ I love you! PKS September Sneak Peeks Day 2 ~ Smile! PKS September Sneak Peek Day 1 ~ make a wish! MCT Tag It Tuesday ~ wishing you sunshine!